Miminashi’s onigiri — one of the best I’ve ever had. When Chef Curtis Di Fede first visited Japan nearly three years ago, he was smitten. So much so that he’s been back nine times since then. It also prompted him to leave his partnership with the Southern Italian restaurant Oenotri in Napa in 2014 to strike out on his own to open his own version of a Japanese izakaya, Miminashi, this summer in Napa. I had a chance to try it recently, when I was invited in as a guest of the restaurant. 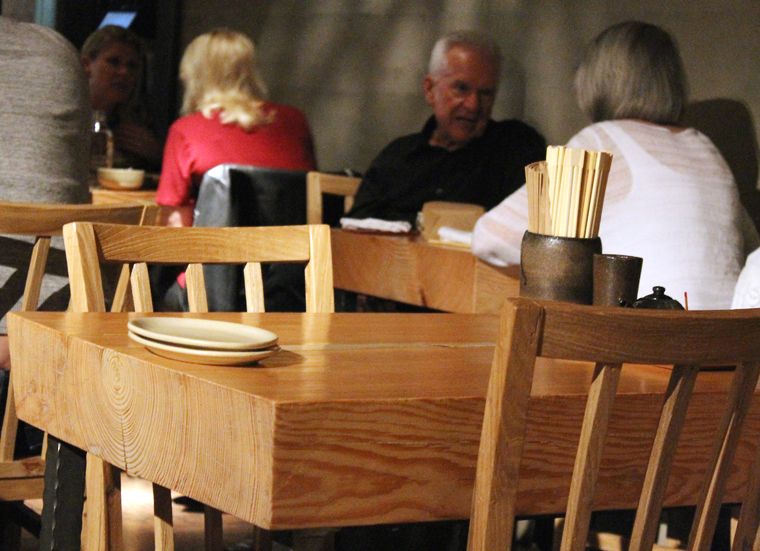 The space is moody, incredibly dim, and intimate with its substantial, block wood tables and simple wooden chairs. It makes you feel as if you have stumbled inside a special little place that only insiders know about. That’s especially true because the entire doorway is made up of hand-carved wood. You have no clue as to what lies inside until you pull open the door to reveal one of the most dramatic ceilings I’ve ever seen. 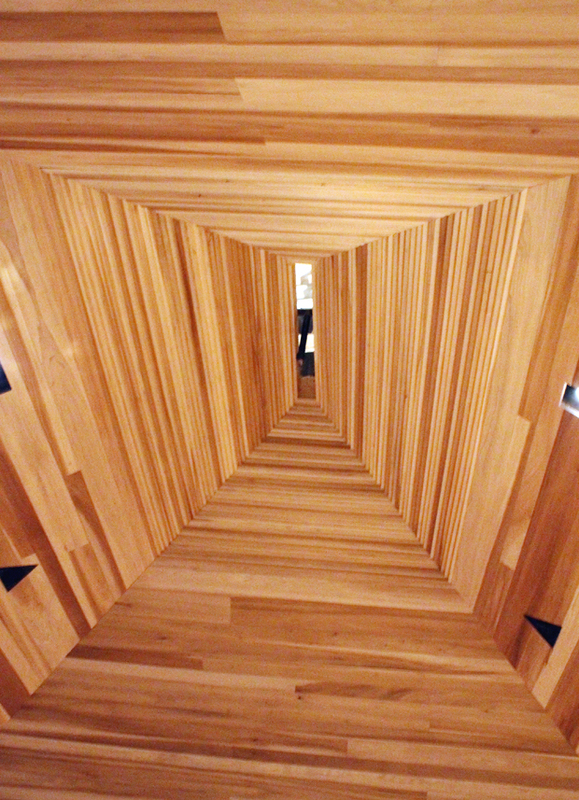 It’s made entirely of wood, pitched like a temple, soaring upwards and narrowing the higher it ascends. Block wood tables and concrete walls. 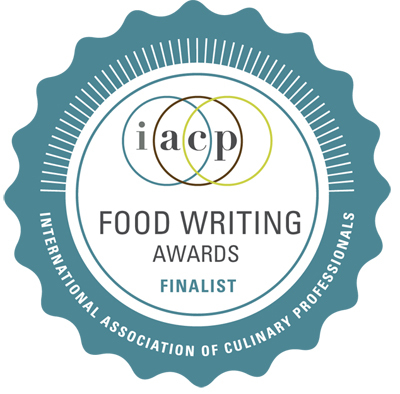 The food hews traditional yet has been elevated anew with Di Fede’s learned touches. 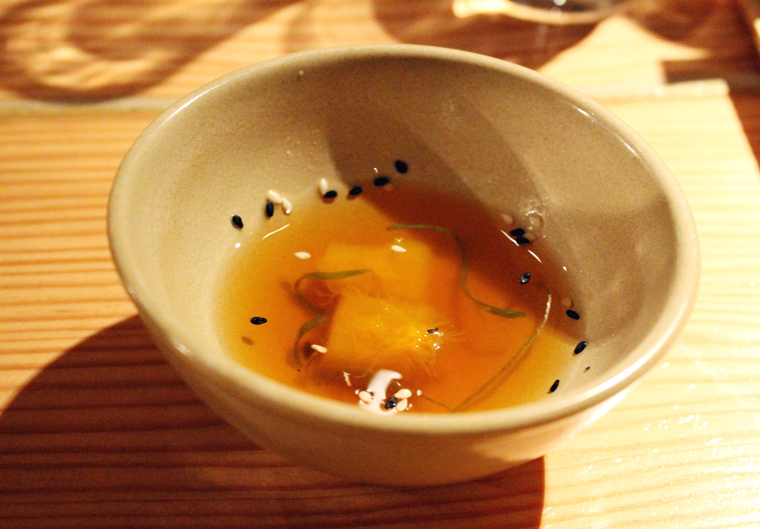 The meal starts with an amuse: small pieces of tender Kabocha with green onion afloat in soba dashi. It’s a savory, briny mouthful with just a little sweetness from the squash. The amuse of Kabocha squash. 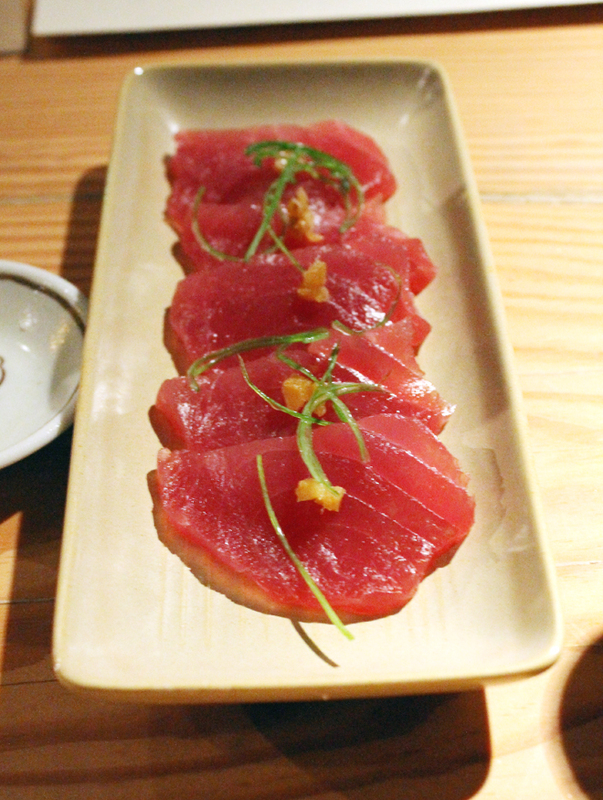 We started with the yellowfin tuna ($12) dressed with preserved yuzu and green onion. Freshly grated (real) Japanese wasabi is an additional $4.50. You only get a tiny amount, but then again, you don’t want to obliterate the richness of the tuna with it, even if real wasabi is tamer with a more floral character. 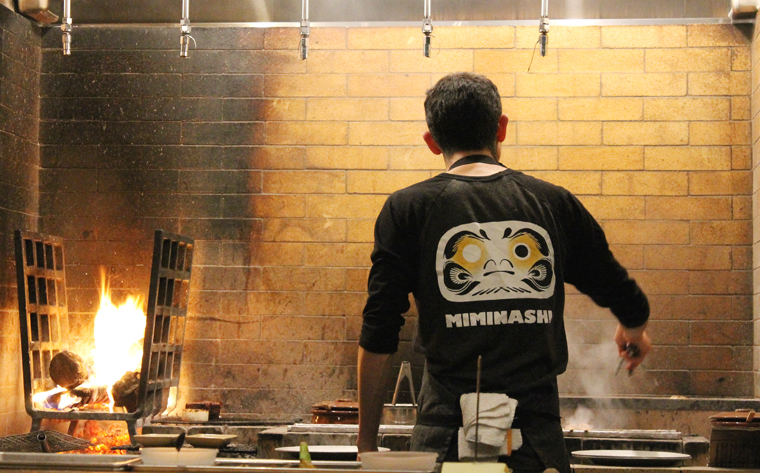 The grilled selections get cooked over hotter-than-hot binchotan (Japanese charcoal) in an open kitchen area. Choose various parts of the chicken or vegetables or larger selections such as salmon collar or pork jowl. 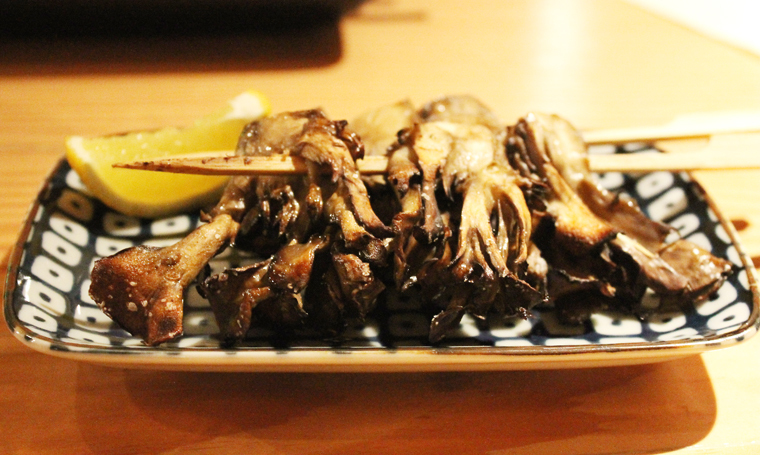 The Maitake mushrooms ($4.50) get incredibly smoky from the grill. They are so buttery tasting, with their very edges getting charred and crisp. 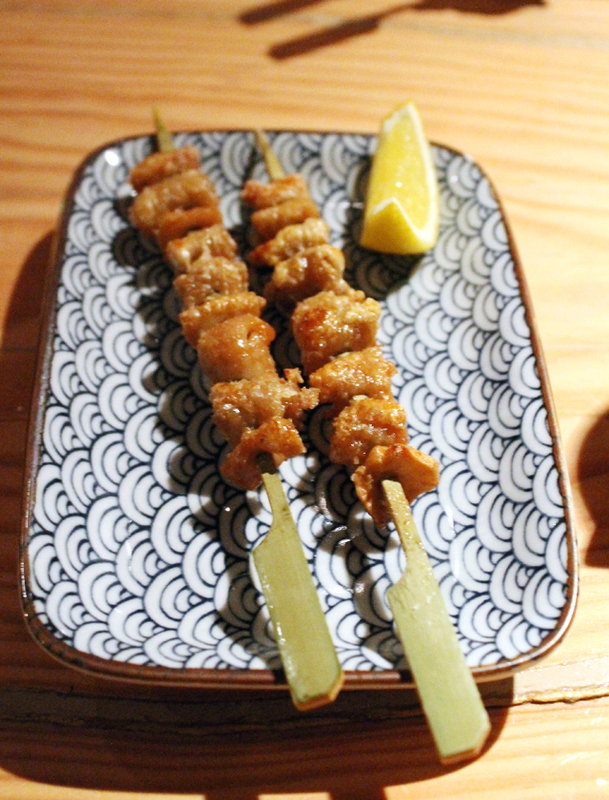 Chicken skin ($6) is always a must-order. You dream of getting skin this crisp on the roast chicken you make at home. It won’t happen. So just enjoy the skin solo here. 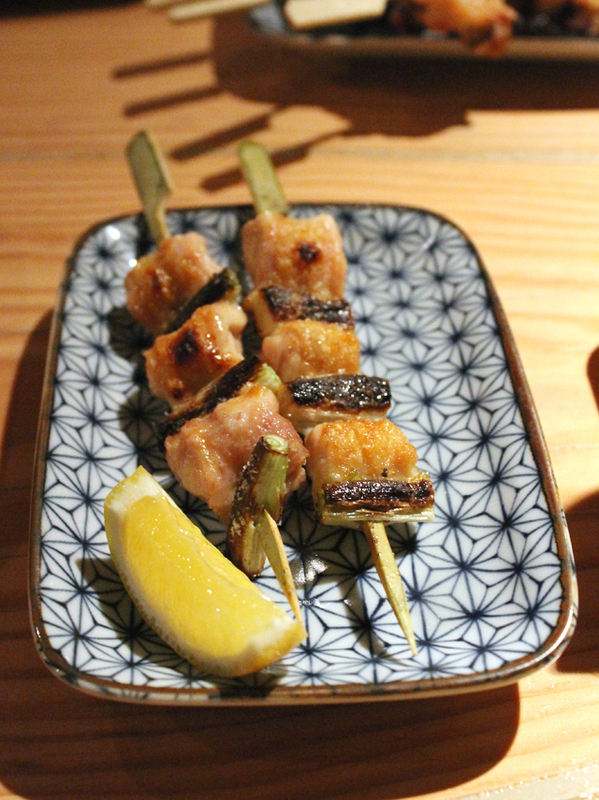 The grilled chicken thigh portions are threaded on skewers with green onions that turn ever so sweet. The thigh meat is tender as can be. 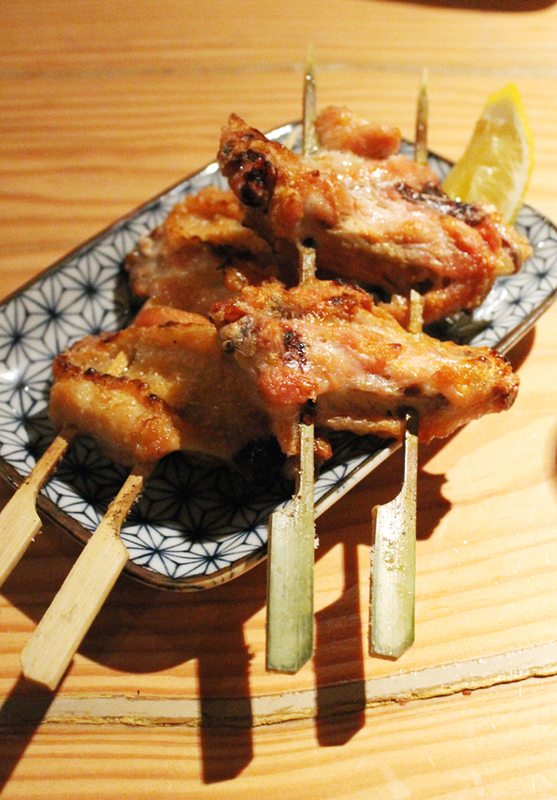 Yakitori chicken wings ($7) get really nicely crisp on the outside from their time on the fire. 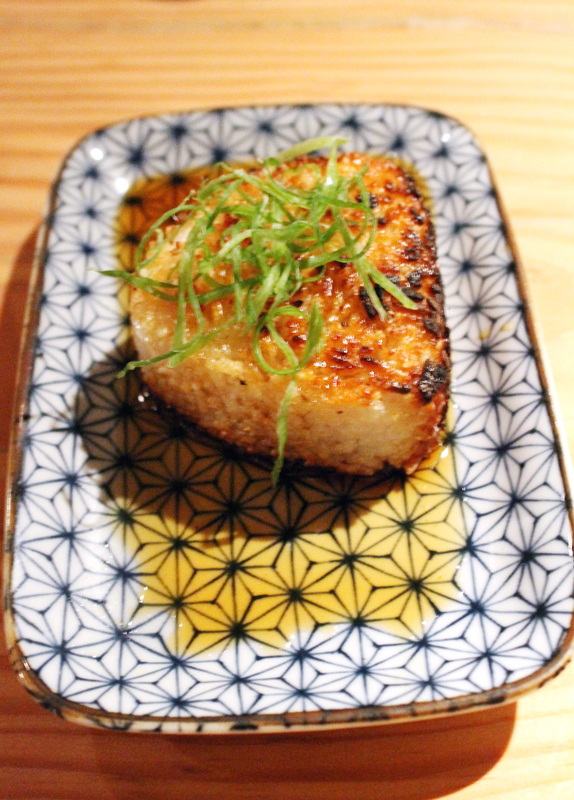 Yaki onigiri ($4) takes 15 minutes, but it’s worth your patience. This has to be the crunchiest version of this classic Japanese snack that I’ve ever had. Your fellow diners can practically hear the crunch as you bite into it. How can a grilled rice ball be this exciting? It just can when it’s done this well. 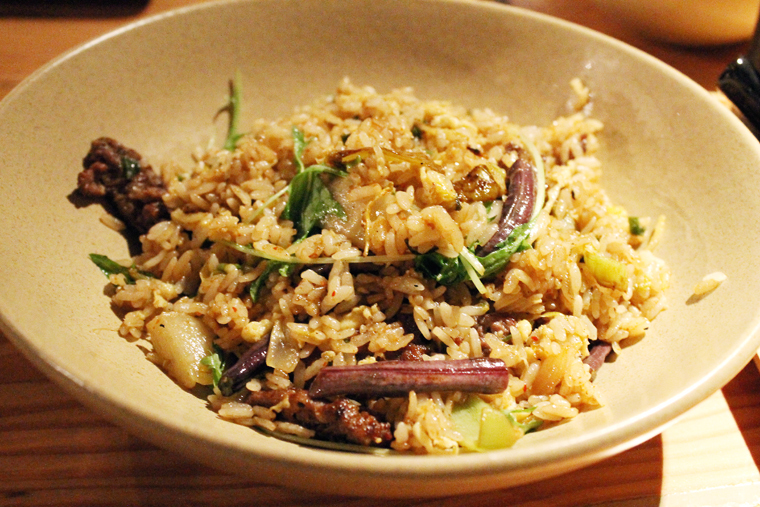 Fried rice ($16) is quite different here. It’s made with kimchi, pole beans, egg, gypsy peppers, cherry tomatoes, mizuna and blood sausage. 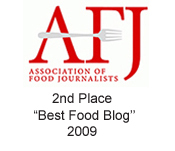 But it’s not blood sausage like the British do, where it’s so rich and full-on iron-tasting. Instead, this is more like pieces of crumbly, spicy pork breakfast sausage made slightly more intense and richer tasting. The rice is fluffy in texture. And the whole dish is complex yet comforting in nature. 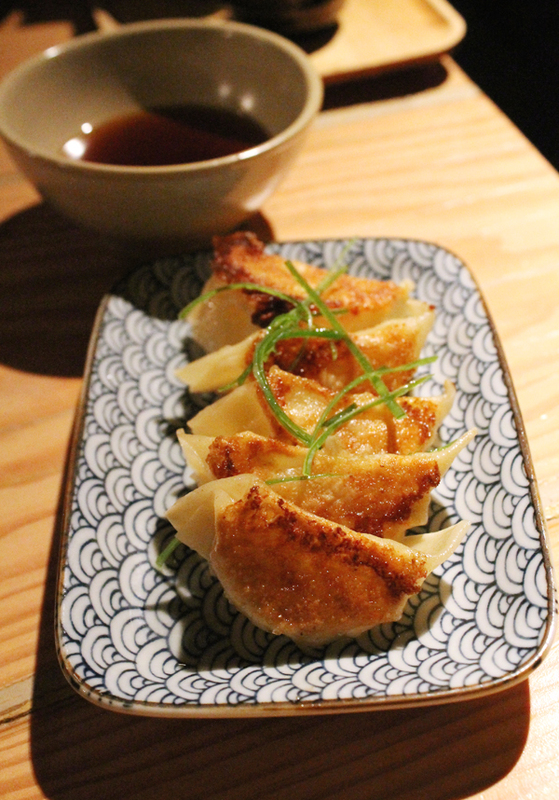 Gyoza ($11) arrive deeply golden and crisp on top, and juicy with a filling of Georgia white shrimp, ginger and shiso. 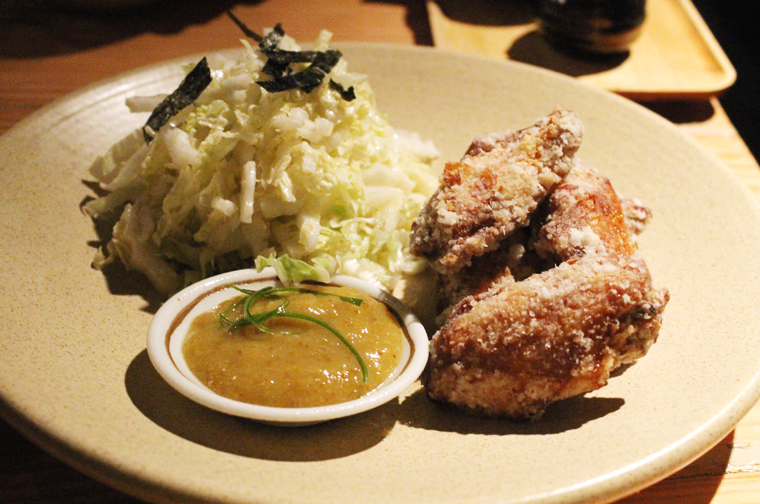 Marin Sun Farms fried chicken wings ($14) sport the lightest, airiest batter. The shredded cabbage salad alongside offers up a refreshing counterpoint. The star of the dish just might be the fig-miso dipping sauce. It’s almost like a mostardo or even a kicked up plum sauce that has a concentrated fruit flavor, along with a sweet-savory piquant quality. The only dessert offered is soft-serve ($7). There’s even a walk-up window next to the entrance in case you want to get some to-go. There are various toppings and sauces to choose from (50 cents each). You can also have the soft-serve in a house-made waffle cone or waffle bowl for an additional $1. 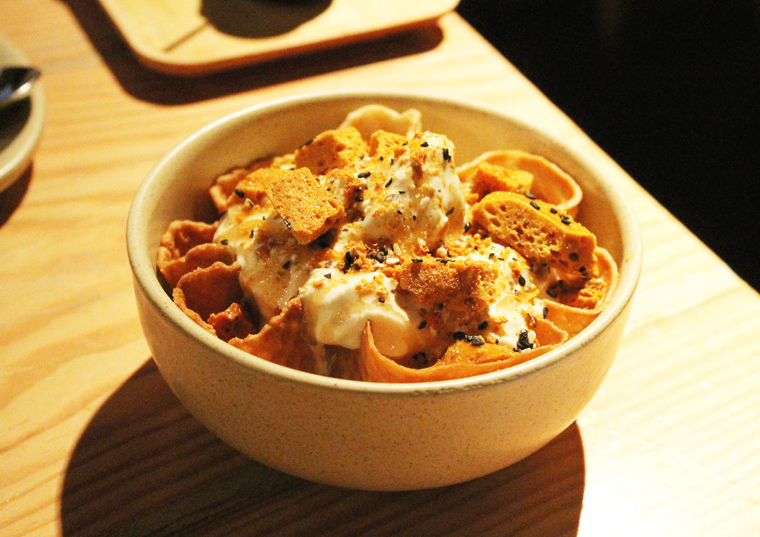 I went with the apple cider soft-serve in a waffle bowl with sesame honeycomb candy and whiskey butterscotch sauce. Create your own soft-serve combo. The waffle cup is thin and crunchy, and tastes of vanilla. The apple cider soft serve was subtle tasting and had a light body to it. The honeycomb candy was airy, crunchy and stuck to my teeth as it should with its lovely honey flavor. It was an ice cream creation that celebrated autumn. I only wish the whiskey butterscotch sauce was smoother, as it had a rather granular texture. Di Fede says that the place has been a hit with locals from the start. The tourists took a little longer, but they, too, are now finding their way here. 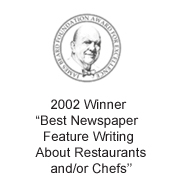 It’s nice to see that when a new restaurant dares to break from the usual Napa Valley Mediterranean mode that it is so applauded and appreciated. Great to see more Asian influences in wine country!